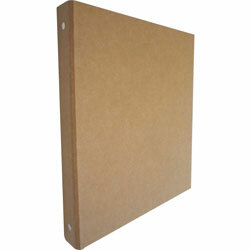 Environmentally friendly, three-ring binder features a simple, yet durable, uncovered, fluted chipboard that is 100 percent recycled. To reduce waste found on most binders, binder has only what is needed: a cover and three rings. Binder is easily recycled by removing the three-ring mechanism held in place with removable screws. PVC-free binder contains no VOCs. 5" Brown Non-View Binders from Aurora! 564 In Stock today.